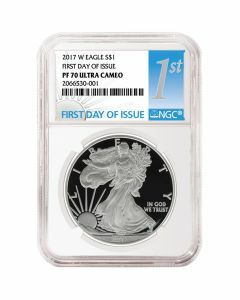 Among the three American Silver Eagle variants released annually, the silver proof version coins hold the most visual appeal for collectors and investors. The frosted finish enhances the brilliant designs on the obverse and reverse, while the polished silver surface of the coin gives off a dazzling gleam. 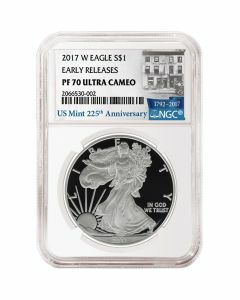 Although the United States Mint strikes proof coins with a much slower and careful minting process, variations in quality do appear from time to time. Hence, collectors rely on graded coin specimens from trusted coin-grading agencies like the NGC (Numismatic Guaranty Corporation). NGC was established in 1987, now headquartered in Sarasota, Florida. With the successful grading of over 35 million coins under its belt, it is now the largest third-party coin-grading agency in the world (by volume). Moreover, NGC has been the official grading service for renowned associations like the American Numismatic Association (ANA) and the Professional Numismatists Guild (PNG) for over a decade. Such is the trust and respect for coins graded and certified by NGC that they carry premiums over the ungraded variety. 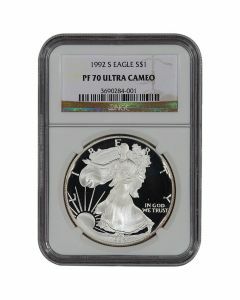 However, for collectors and investors who are on the lookout for a particular quality/certification/condition, the premium commanded is worth it. A proof coin can be assigned a grade of PF-1 through PF-70, depending on its condition; a grade of PF-70 indicates a totally perfect coin specimen. Experts at NGC have a thorough inspection process, ensuring that each coin reflects its grade. PF-70 grades are awarded to coins that display no physical imperfections, even when magnified 5X. Furthermore, NGC also grants certain designations to proof coins. ‘Ultra Cameo’ is one of the more popular and sought-after designations. It indicates a coin specimen with a high contrast between the polished silver surface and the frosted designs, adding considerable elegance to the product as a whole. In order to highlight the grades assigned to a coin, NGC uses unique labels detailing it and seals them with the coin in an inert plastic slab. This slab assists in protecting the coin from external tampering and corrosive elements in the atmosphere. 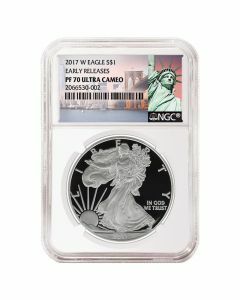 Obverses of these coins bear Adolph A. Weinman’s famed ‘Walking Liberty’ rendition. Lady Liberty strides toward the rising sun, holding olive branches under her arm. 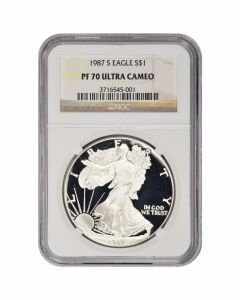 This design was originally used on the Walking Liberty Half Dollar Coin, and has become one of the most admired designs to feature on American coinage. 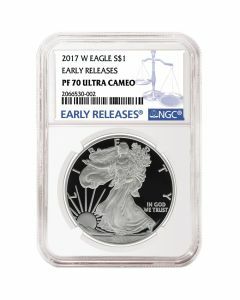 John Mercanti’s Heraldic Bald Eagle portrayal graces the reverses of these Proof American Silver Eagles. Inspired by the National Seal of the United States, the design highlights a mighty Bald Eagle stands behind a striped shield, clutching arrows and an olive branch in each of its talons respectively. Thirteen stars above this image honor the 13 original colonies of the United States. Simply look for the precise grades and years of issue you need for your coin collections and precious metals portfolios, completing and expanding them. With various grades and certifications, our wide selection of American Silver Eagles ensures that every customer finds exactly what they need.